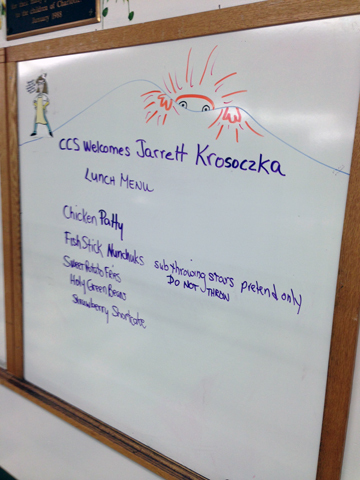 Jarrett J. Krosoczka, That’s How a School Visit Is Done! Jarrett J. Krosoczka is a formidable name; the person attached to it could have been a lowering tower of intimidation. 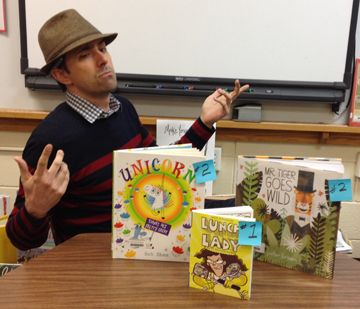 Fortunately, the author/illustrator of the Lunch Lady series, Platypus Police Squad: The Frog Who Croaked, and several picture books (including Punk Farm on Tour) turns out to be – like his books – funny, warm, and lively. 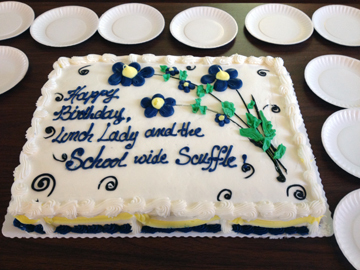 When we were offered a visit to launch the newest Lunch Lady title, Lunch Lady and the Schoolwide Scuffle, we leapt. We knew schools would be eager to meet Jarrett, and were they ever! We set up two visits and a store event, and the day was glorious. Jarrett does a fantastic presentation that really resonates with kids, and the schools created an amazing welcome for him. It makes all the difference when teachers get their kids excited about an author/illustrator, prepare them in advance for the visit, familiarize the students with the guest’s books, and invite the kids to be creative themselves. Both schools, Charlotte Central and the Orchard School, did that beautifully. Doesn’t get better than that, does it?! She also thanked the bookstore, saying, “I am constantly grateful for your advocacy for young readers. Your work in connecting Vermont students with mentor authors is truly appreciated.” What a gracious, thoughtful thing for her to say. That is balm for a bookseller’s day! Below are some images from Jarrett’s visit, and at the end of the post, a behind-the-scenes peek at how a bookstore prepares for an author visit like this. In-your-face invitation just inside the Flying Pig front door. Jarrett with one of the Charlotte Central School lunch ladies. The menu at Charlotte that day featured Fish Stick Nunchucks (with a caution: Do not throw!). 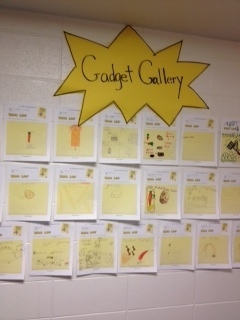 The Orchard School also went all out, creating an entire Comics Corridor of art by the entire K-5 school. Their librarian, Donna, is a dynamo. She’s also a tech-savvy, social-media wonder who tweeted about the visit, made Vines of the Comics Corridor beforehand, and pretty much turned January 28 into Jarrett J. Krosoczka Day. 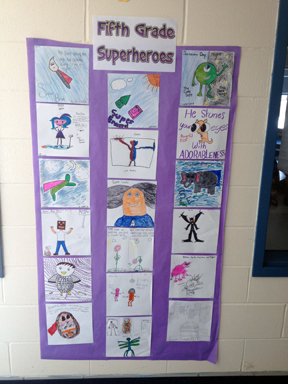 One small segment of the Comics Corridor at the Orchard School. Jarrett speaks to a packed all-school auditorium at Orchard. The Orchard School had bought Lunch Lady aprons, which Jarrett autographed. 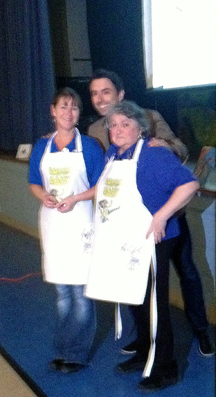 The lunch ladies were completely surprised and delighted by their aprons! And shy about being in front of the crowd. One of the women said, “Oh, no! I’ve just come all hot from the kitchen!” But of course they looked lovely. 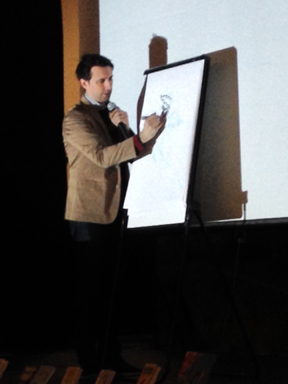 At the end of his presentation, Jarrett draws for the kids. They can’t believe how fast he can create a lunch lady or a platypus! 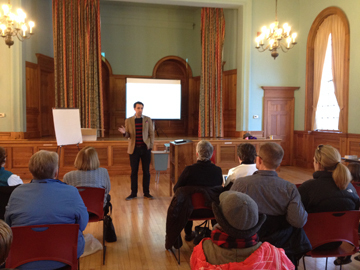 After the school visits, Jarrett came to Shelburne Town Hall for our store event. You’d never know Jarrett had already done two big presentations and signed 300 books. He was fresh and entertaining and give an entirely different talk at the store event. What a champ! Happy exhaustion at the end of the day. We create order forms and teachers send them home a few weeks before the event. We offer schools 20% off these event titles. That’s our normal school-purchase discount anyhow, and it gives a little break to families who might not have a lot of extra funds for books. One thing the Orchard School did that we LOVED was to ask the PTO to buy a book for all of the kids who use the free or reduced-fee lunch program. That way, no child who wants a book is shut out because they can’t afford it. This is so, so important, and something we’ve struggled with about these events. I don’t want ANY child to feel left out at an event! So this is a marvelous solution we will mention as a possibility to all schools in the future. Once the orders come back, it takes a few hours to process the checks and cash and hilarious math mistakes (it’s figuring out the tax that trips people up; I’ve vowed that next time, I’ll just build tax into each book’s cost on the order form). 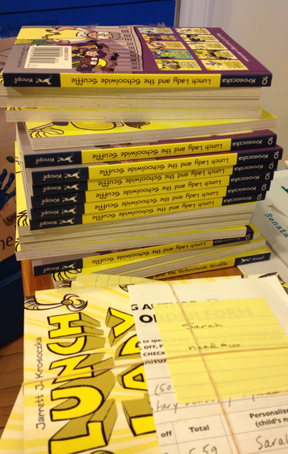 Then we pull books for each order and make Post-Its for each title with the child’s name, so that Jarrett can autograph quickly and accurately. We rubber-band individual orders, then sort the books into bags separated by classroom. 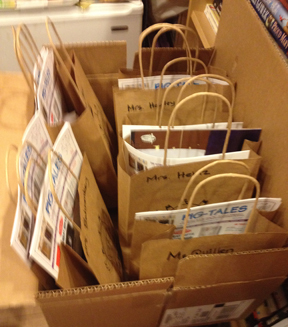 We box up the bags, and off they go. That’s probably more than you ever wanted to know about the back end of a bookstore-coordinated author visit, but there you have it! With something like 600 inspired children, scores of delighted teachers and customers, two satisfied principals, and lots of wonderful books sold, well, it’s not hard to imagine that that adds up to happy author, publisher, publicists, and us! 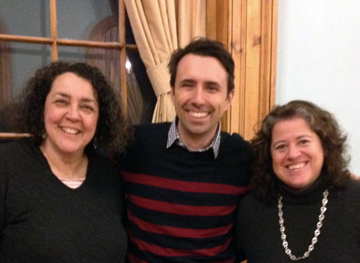 Thanks so much to Jarrett J. Krosoczka, Random House, Deb Shapiro, Deborah Sloan, Heidi Huestis, and Donna Macdonald for a fabulous day! This entry was posted in Uncategorized on January 30, 2014 by Elizabeth Bluemle. 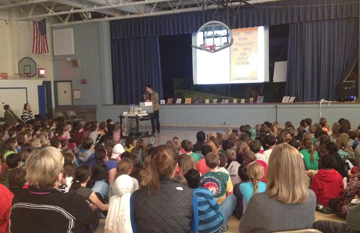 Thanks for sharing this behind-the-scenes look at very successful school visits and bookstore event. I, too, had the good fortune to hear Jarrett speak at an SCBWI event in L.A. He’s terrific in so many ways. It was good to see how much work and preparation go on in advance of and during these visits. Gives me more appreciation as a visiting author for all the hard work involved in these events. 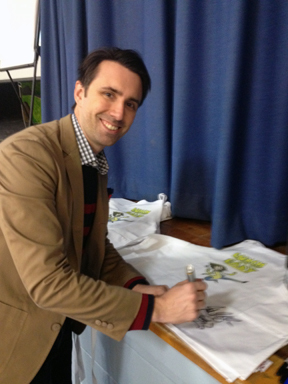 I heard Jarret speak at an SCBWI convention in NYC. He does a great job with adults too! this is so helpful! Thank you for sharing !! I love everything about this post! Let’s see, some highlights… I already knew Jarrett was a genuinely nice guy from his Facebook posts, but it’s good to hear it from someone who’s met him in person. I think it is AWESOME that he brought aprons for the lunch ladies. That PTO is my kind of PTO—nice job making sure every student could have a book. Fabulous prep by the schools; every author should feel that appreciated and welcome when they walk through the doors. Jarrett’s patience and kindness as a parent tops everything off wonderfully. 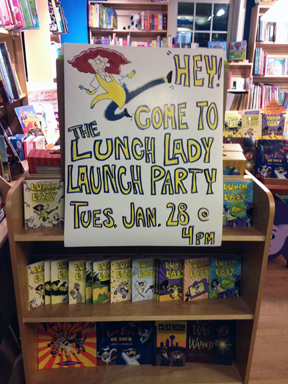 AND, your bookstore’s dedication to author visits is to be commended! Thanks so much for your kind comments!! 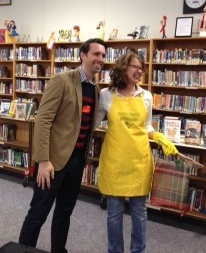 One note: while Jarrett is fabulously kind and generous, it was actually Donna (librarian at the Orchard School) who surprised the lunch ladies with the gift of aprons. Jarrett was delighted to autograph them.